If these negative pressurized CVE units use a single-HEPA filter , they must be hard ducted to an external exhaust system. 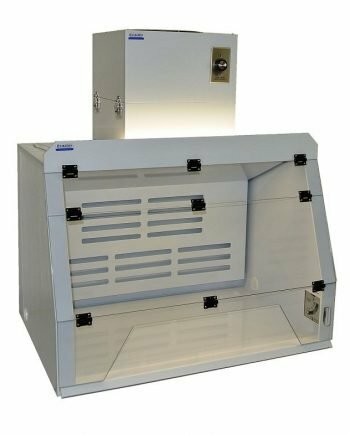 Optional redundant filter (Double HEPA filter) available for application require a portable and ductless containment hood. In the hood with single filter, the fan pulls air in through the front, away from the operator, across the work area, through a HEPA filter to collect all harmful particulates for environmental protection, then the air is being taken out the building through the exhaust system and ducting. 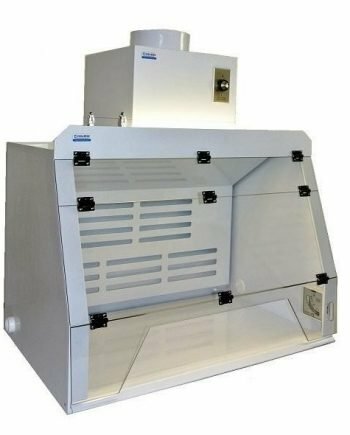 They utilize a powerful adjustable fan and filtration system to protect user during pharmaceutical compounding, powder weighing, or measuring drug dosages. They meet the requirement of USP and CCS 1735. Hood and work surface are constructed from corrosion resistant polypropylene. They are available in 24″, 32”, 36” and 48” hood’s width. Cleatech containment ventilated enclosures feature rear baffle (slotted panel) located in the back of the hood that’s designed to reduce turbulence, to ensure the work surface is well ventilated. The front airfoil at the hood face allows more even airflow into the hood by avoiding sharp curves that can create turbulence. It’s removed for cleaning purposes.